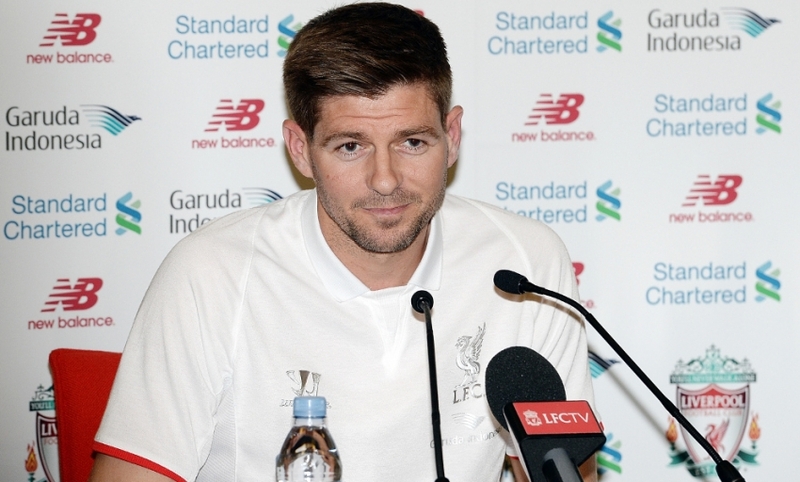 Steven Gerrard held a farewell press conference at Melwood on Thursday ahead of his final Anfield match this weekend. Here's what the skipper had to say as he reflected on 17 glorious years with the Reds. Steven, how are you feeling about saying goodbye to Anfield? I'm good, I'm looking forward to it. I'm looking forward to the match and I want to win the game desperately. I want to finish on a high at Anfield in front of our supporters, but there's no getting away from it - come the end of the game, when I get the chance to say goodbye, it will be an emotional time. You've spoken about your regret at not winning the title during your time here, so how do you look back upon those 17 years? I look back at it with pride. I am really proud of what I've achieved here. All the trophies I've won here and all the great memories I have. Not winning the Premier League will be a dint in that, but there's nothing I can do about that now. It's a regret I'll go away with, but I have got to look at the bigger picture. Growing up as a boy, dreaming of playing for Liverpool just that one time, to sitting here now with 708 appearances, I've achieved an awful lot more than I thought I would have at the beginning. In terms of this club progressing further, what state do you feel you're leaving the club in now? What's needed to ensure last season and challenging for the title isn't a one-off? Every season, this squad and this club tries to add good quality players to it to challenge for the next season and what trophies we can try and win. I think this season we've fallen a bit short, but I still feel there's a fantastic core of players here with huge potential. I am hoping the owners will back Brendan again and bring in that bit of quality that can help us go one step further next year. We've come very close in a couple of cup competitions this year and we've also got close to the top-four positions and that's with losing arguably the best player in the world last year in Luis Suarez and also not having our striker not available for much of the season in Daniel Sturridge. To come so close without those two available, I think we've done okay, but I think next year we can go one better. In some ways I suppose it'd be nice to finish your Liverpool career at Anfield, but knowing you you're probably thinking about playing in that final game of the season as well. Is that the way it's going to pan out? You'll have to ask Brendan what his next two team selections are going to be, but I want to play every minute possible, of course I do. He will know that and I think all you people know that. That's what I intend to do. I want to put in a good performance personally at the weekend, try to get a win and say goodbye to everyone at Anfield and all the supporters worldwide. But I still feel I want to be involved against Stoke. It's been a week dominated by yourself - a lot of interviews, a lot of build-up to the match at the weekend. I don't think this room has ever been as full as it is, either. How does it make you feel all this attention and focus? I am not really one for attention or focus and I feel a bit sorry for my teammates this week. Obviously, a lot of attention is on me and I am sure it will be at the weekend. When the whistle goes it'll all be about the team and the team trying to get three points. All I can do is apologise if I have taken any attention away from the players. It's never been my intention to grab any glory or attention all the long. I am aware it's all about the team at this club and from day one I have always tried to pull in the right direction for the team. Unfortunately, this weekend it is only normal after 17 years that the attention falls on me. I apologise for that. You have the status of a Liverpool legend. Do you see yourself like that? Are you comfortable with it? No, I don't think so. I don't think many players look at themselves in terms of what they've done, what they've achieved or what the opinion is out in the open about that player. For me, I just work as hard as I can, I try to do the best I can. I've loved every minute of representing this club and the supporters. Every single game, I have tried to do my best. Other people have opinions of you and put you in certain categories. They compare you to players before or players coming through. There is nothing you can do about that. I just try to be the best I can be. You're known as a pretty strong character, but how emotional do you think Saturday will be for you? I don't know. I haven't got a clue. I don't know what it's going to be like come the end of the game when I get the chance to say 'goodbye' for real. I've been dreading this moment in a strange way because I'm going to miss it so much - playing at Anfield, playing in front of the fans. I am going to miss playing with my teammates. It'll be emotional, but the plan is to try and keep it together, stay strong and try and avoid the tears. Do you think we will see a few tears? There's some great footage of you as a young boy - maybe age eight or nine - picking up a Player of the Season award. What would the eight or nine-year-old Steven Gerrard think about the career ahead of him if you could have told him back then? He'd have certainly have grabbed it with both hands. If someone had said to me when I was first started going to the Academy when I was eight years of age and used to get two buses up to Anfield to train, 'You're going to play 708 games for Liverpool and you're going to win trophies but have some low moments as well as high moments', I would have said, 'Yeah, that'll do for me. I'll take that'. Let's take you back to one of your high moments. When people say the word 'Istanbul' to you, what emotions does that conjure up? Still till this day, the hairs on my neck stand up. It was the best night of my life. It's the pinnacle of every footballer - it's the best cup to win. The way we went about it and how the evening panned out, I think it'll go down in history as the best Champions League final ever. As captain of that team, there was no prouder man on the planet that night. We know about your most memorable moments in a Liverpool shirt in terms of the Champions League final, but is there a game, a goal or a moment in particular at Anfield that stands out for you? I think a game would definitely be the Everton game when I got the hat-trick. After all the stick I've had off the Bluenoses over the years, that was a nice feeling. If you're talking about one individual goal that was so important for the team and the club, that helped us progress to that incredible night in Istanbul, it'd have to be Olympiacos. The timing of the goal and what was needed on the night...in the dressing room afterwards, I realised it was an important goal to help the team progress, but it wasn't until Istanbul had calmed down a couple of weeks later and I reflected on the whole journey of the Champions League triumph, I realised the Olympiacos goal was such a huge goal. Who or what will be your most difficult goodbye here at Liverpool? It'll be the supporters as a whole. They've given me incredible support since day one. They've been there for me throughout this journey. I've had some really cruel lows and some incredible highs, but their support to me has never changed. There might be a few individuals who have changed their opinion of me over the 17 years, which is fine, but as a whole, at Anfield and around the world, I have had incredible support. That will be the emotional goodbye. Just here at Melwood, the staff and the players that I work with day in, day out, that's what I am going to miss the most, as well as playing at Anfield. Do you have ambitions of becoming a coach or manager one day and maybe even one day return to Liverpool? I think it's a bit early to answer all of those questions. I've certainly got ambitions to stay in the game, I'm currently taking out my UEFA coaching badges and trying to progress up that ladder. But I think to take a position or role at this football club first of all you have to be good enough. You never take a role here on reputation or name, the demands and the expectations at this football club are so high I think you'd be very naive and stupid to take a role just because you're Steven Gerrard or because you've had a good career on the pitch. I think in a couple of years' time, when I've come out of the city for a bit and reflected, if there's a role on offer that I feel I can contribute in and I'm good enough for then I'll certainly consider it. I've been coming to this club since I've been eight years of age and I do feel as if I can contribute in some role in the future. Do you hope that part of your legacy is to inspire other local youngsters to see what you've achieved and follow in your footsteps? I hope so but that's not just me, there's been many a great player before me, many a great role model and inspiration who helped me achieve what I have done today. If younger players want to look to me and take little bit from my game and see what I've done on and off the pitch for the last 17 years and that helps them, I'll be a very proud man. Who are the people you'd say over the 17 years have had the biggest influence on you, whether it be coaches, players or managers? I think from a coaching point of view from the ages of eight to 18, I have to mention Steve Heighway, Hughie McAuley and Dave Shannon because they prepared me to become a professional. They helped me as a person and as a player to be ready for all the challenges that come your way when you're a first-team player. Then I owe an awful lot to Gerard Houllier, who give me my opportunity here. He was almost like a father figure, put his arm around me and helped me an awful lot tactically, improved me a lot and I won my first three trophies under Gerard. He gave me the captaincy at 23, which was a very bold thing to do at a club this size. To take the captaincy off a player like Sami Hyypia and give it to me was a very brave thing to do, so I owe an awful lot to him. If you do go on to have a coaching career, what would you take from the managers you have worked under? Well I think I'd take bits and bobs from them all if I did ever want to or become a manager. I'd like to do it my way and take things from them all. I've been very lucky to work with some fantastic managers over the years. With Brendan, I've enjoyed the last three years with him and I almost wish I met him a lot earlier, when I was in the peak of my playing days, because I certainly think I'd be here talking about trophies now. Getting to play under Kenny Dalglish was a wonderful experience as well, someone who I watched many tapes of and is my dad's hero, that was a great time. Roy Hodgson's time didn't work out here but I've got a good relationship with him, more so with England of course. Rafa Benitez, who we shared Istanbul with, tactically as a player he improved me so much. So it's difficult to pick one, or pick who I like the most, who I thought was the best, but as a whole I've been so lucky to work with so many. What opportunities do you think there are for the eight and nine year olds who, like you were, are out kicking a ball on a Huyton estate nowadays? I think they've all got the same chance as me. If you want to be a footballer you've got to practice as much as you can, there are plenty of areas around council estates now that I had available where you can practice. There are plenty of DVDs and footage to watch, to look at players to aspire to - the opportunity is there for them. I think the difference nowadays is that they've got a lot more distractions. When I was a young kid the priority for me was my ball and football kits. I wanted it and I worked so hard for it, so if they want to follow in the footsteps of not just myself but all the players in the Premier League, they've got to want it and they've got to work for it. Now you've gone and Jamie [Carragher] has gone, what do you think the prospects are of more Academy products coming through? I think it will happen again. This club is renowned for bring talent through: Robbie Fowler, Steve McManaman, Michael Owen, David Thompson, Danny Murphy signed from Crewe at a later age, Jamie, me, Jon Flanagan, and you see Jordon Ibe and Raheem Sterling now. If the players are good enough and they get themselves into a position and they're prepared for it, Brendan has shown that he'll give them a chance and I'm sure managers in the future will. But first of all they've got to be good enough. What is your advice to the likes of Ibe and Sterling as they consider their futures? For me I'm always going to be biased toward this club and I said earlier in the week my advice to Raheem is, where he's at now at his age, I think he needs a manager who believes in him, who's going to play him, to help coach him. I think there's nobody better out there than Brendan Rodgers. My opinion is he should sign a new deal here, I think it'd be the best for his career but that's something I can't control. The young lads here, there's no better manager to learn from and get attention from because Brendan is a fantastic man manager and he puts a lot of time and effort into every individual in the squad. I think the danger for these younger players is that they want it all too soon and they chase it. They become one of a number if they go to any other club and they don't get that attention or that love or care that they'd get at Liverpool. Anyone else you'd like to thank? My family. They're the number one - my family and friends who have been with me every single game, home and away all over Europe. They're the people that are with you in and around the games when you're either on an incredible high or you don't want to come out of your room. They're the people that help pick you up and get you going for that next game. My family and friends are the most important people to me and obviously everyone connected to the club. Also a special mention to the media as well, you have always been respectful and honest with me and I've always tried to do the same back so thank you all.